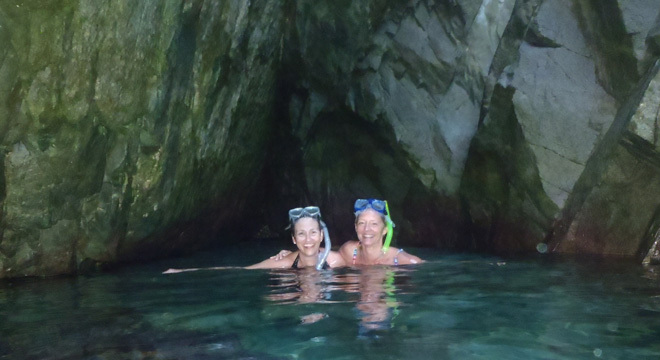 The bays of Huatulco hold some fantastic snorkeling spots. I know them all and will take you to them. St. Augustine Bay / Bahia San Agustin is one of the best spots but there are many more as well. Another great spot is Bahia de Chachacual which is only accessible by boat. Snorkeling can be included in the regular bay tour, and usually is. If you do not have your own snorkeling equipment I will make arrangements for you to pick up any necessary equipment before the tour begins. The water temperature is very comfortable at all times of year. From May to November the temperature at the surface is usually between 82° to 90° F / 28° to 32° C. During the rest of the year the temperature is closer to 73° F / 23° C.
I will get in the water and snorkel with you. I'll even seek out the amazing undersea creatures for you to see. Together we'll find starfish, puffer fish, sea urchins, turtles, moray eels, sea horses and mucho más! *This is the range of hours available. 6:30 am is the earliest start time; we can meet anytime after this if you prefer. Typical tours are anywhere from 2 hours to 8 hours in duration. I do NOT offer multi-day tours.